A new proposal promises to shake up the rugby game with the introduction of a ‘World League’ that emulates football’s new European Nations league concept, which came into effect this year. Though the World Rugby Union remains tie tied on these developments, it will be one of the issues under discussion on the 26th of September 2019, when the top rugby brass meet in Sydney. The organization’s vice chairman, Agustin Pichot, has disclosed that he has shared this information with the French, New Zealand and South African head coaches before the event takes place. This will see the removal of the June and November tours, to set the stage for the 12 Nations tournament that will see the north compete against the south each year. In the proposal, 12 top teams will be pitched against each other in four groups, each group consisting of three teams each. Each pool will be hosted by a different country and the event will run for five dates, with the first three dates being set for the group games, while the fourth and fifth dates will host the semis and finals. The World league will help currently top ranked teams that do not get a chance to play against their peers gauge their might against the strongest teams in the sport. Based on the current rankings, Japan, Tonga and Fiji would be thrown in the mix, providing much needed exposure among top ranking teams. Since the agreement to change the international calendar, this new event will reap the benefits of moving the test window from June to July, from 2020 onward. 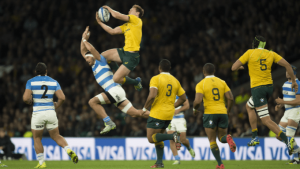 There will be no changes in the Rugby Championship (South) and the Six Nations (North) test competitions, allowing the Super Rugby to run smoothly without interruptions. This will come as good news to the SANZAAR nations who have had to disrupt their season around June, while it will come as a blow for the English and French teams who will now need to adjust their domestic season. The Rugby Union have been working on avenues to grow the games’ revenues around the globe. According to the union, almost 56% of international rugby games have been friendlies and there is a need to swing this to the advantage of the sport, by making the games more competitive and meaningful. Bringing the South and North together in one competition hopes to achieve this by offering much needed exposure.